Main windows have an optional menu bar at the top. The menu bar is not visible by default, and show_all() does not make it visible. The menu bar requires explicit steps to construct it and make it visible. Use get_menubarlayoutmanager() to get the menu bar's layout manager. Use the layout manager's append_menus(), insert_menus(), append_right_menus() and insert_right_menus() to construct the main window's menus. These methods return a x::w::menubarfactory for creating new menus. Create the rest of the display elements in the main window normally. This can be done before or after the menu. Use get_menubar() to return the menu bar's container (get_menubarlayoutmanager() is equivalent to get_menubar()->get_layoutmanager()) and show() it. // space between the left menus and the right Help menu. // Create the "View" menu first. // one takes a factory as a parameter and creates a menu title. // to construct a plain text title. // responsible for creating the contents of the new popup menu. // create the "File" menu. // it gets created, the menu bar needs to be explicitly show()n.
// the menu bar, obtaining a persistent snapshot of its contents. // Open one of the file dialogs. // current directory, by default. // Populate the "File" menu. // (using the pointer, or the keyboard). // "New", "Open", AND "Close"
// "Options" item in the "View" menu. std::cout << "\"Options\" is now enabled: "
// x::w::submenu wraps a creator for the submenu. // whether the option is selected or unselected. // Factored out for readability. Invoked by "Help->Question" menu item. // This is an x::w::input_dialog ref, a sub-ref of x::w::dialog. // may not look good in all themes. That's fine. // and the dialog window's title. // and an error message, and shows it. // message dialog gets closed. // custom fonts and colors. // which files to show. // pattern, but a regular expression. This uses the PCRE library. // patterns based on the file extension. // we'll show *.txt files first. // ok because we have a convenient ref here. Unlike regular display elements in the main window, display elements that make up the menu bar and its menus should not be show()n, except for show()ing the menu bar itself. x::w::menubarlayoutmanager's method that create menus take a creator callback that gets invoked to create the menus. Menus use the x::w::listlayoutmanager, and the callback's parameter is the list layout manager, the layout manager for the new menu that the callback uses to create the new menu's items. The list layout manager takes care of showing and hiding all the menu items, when needed. x::w::main_window's get_menubar() method returns a container with a x::w::menubarlayoutmanager layout manager, that represents the main window's menu bar, which gets show()n after its menus get created. get_menubarlayoutmanager() is equivalent to get_menubar()->get_layoutmanager(). 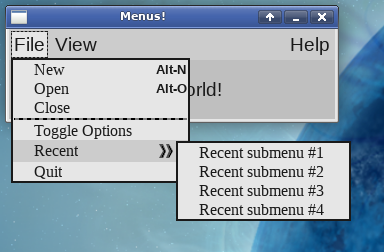 append_menus() returns a x::w::menubarfactory that adds new menus to the menu bar. insert_menus() returns a factory that inserts new menus before an existing menu in the menu bar. remove_menu() removes an existing menu from the menu bar. As part of creating a new menu, the x::w::menubarfactory uses a callback that takes a x::w::listlayoutmanager parameter to create the individual items for the new menu. The factory also returns the x::w::menu that represents the new menu in the menu bar. Constructing a x::w::menubar_lock blocks the menu bar from other execution thread, at which point its get_menu() returns the x::w::menu elements. The menu bar has a second section that's aligned against the right margin, the typical location for a “Help” menu. append_right_menus(), insert_right_menus() and remove_right_menu() are equivalent x::w::menubarfactory methods for the second section (with get_right_menu() picking up the slack in the x:w::menubar_lock.